Is your family less active than they should be? Are you trying to be a good example but the family is just not following your lead? Keeping your family fit can be difficult. Here are some great tips to help you keep your whole family fit in the New Year. Getting the family out and active isn’t a choice. If you give children the option to come on a hike or stay inside and play on their computer, you know what they’ll choose. Instead, make it mandatory. Consider including the family outing with other errands. For example, go for a family hike and then go to the grocery store or out to lunch. Children are much more likely to engage in fitness activities if everyone is doing it. Create regular family outings. For example, ride your bikes or walk to school together. Go for an evening walk as a family. On the weekends, engage in larger activities. For example, go on hikes. In the wintertime you can go skiing, sledding or snowshoeing. 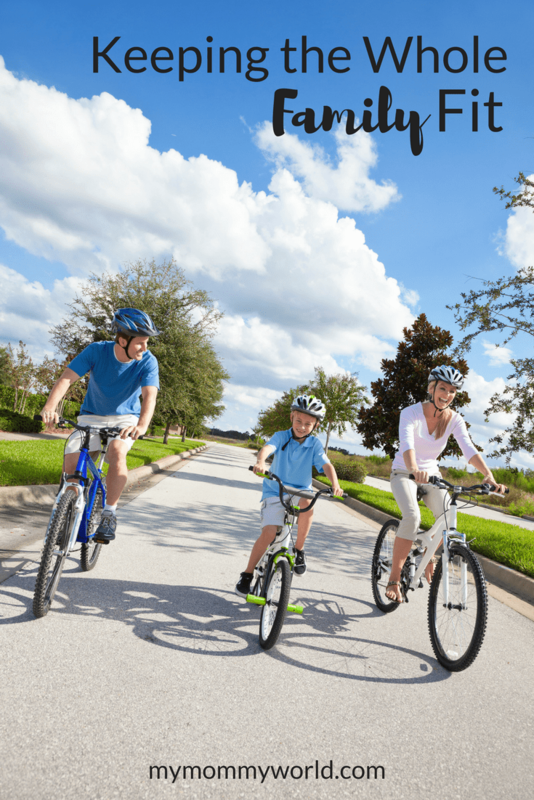 During the summertime you can head to the pool as a family or go for a bike ride. Children really do pay attention to what you do. When you are active they’ll be more likely to adopt an active lifestyle. My kids know that I go to the gym almost everyday, because not only do they see me in my exercise clothes every morning, but I always talk about what I plan to do that day. When you head out to exercise, remember to keep your language positive. If your children think you view exercise as a chore, they will too. If your television, computer and gaming systems are turned off, your children will likely be at a loss for what to do. They’ll be more likely to head outside or to engage in active play. Consider giving them a screen time allowance. They’re allowed 1 hour a day, 6 hours a week – whatever seems realistic for your family. That way when they use their allowance up, they’re done. No more screen time! Remember to find activities that your children enjoy. If you love hiking and your children really dislike it, then hiking is going to become a chore. If they love playing Frisbee golf or scrambling around on the local playground, then make time for those activities. When you pay attention to the likes and dislikes of everyone, then your whole family feels recognized. They’ll have a much more positive attitude about exercise. Getting active as a family is about changing habits. Look for ways you can get people off the couch and moving. Walk or ride bikes to school and around the neighborhood. Go to the park. Engage in activities that everyone loves. Have fun! What’s your favorite way to exercise with your family?